Have you been looking for a folder that can keep up with your kids—and help them manage their schoolwork? Then look no further! 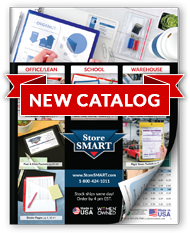 StoreSMART's Plastic Subject Folders are made of sturdy, reinforced polypropylene plastic designed to stand up to the toughest treatment. Unlike paper folders, they won't fall apart or wrinkle in water—so while the sheets inside might get soggy if a classroom experiment goes awry, the folders themselves will be just fine! With a clearly labeled "Save" section to remind students to keep their important notes and papers close at hand, our folders are also ideal for keeping busy students (and their teachers) organized. Our Plastic Subject Folders have been manufactured in the USA for over ten years. Inferior plastic folders can fall apart within the first few days of use—but we're proud to report that some of the first folders we created are still going strong! Each subject is printed in black on the front cover. Choose from the options at right. "Save" is printed in black on the inside right pocket. Give students a place to store their most recent notes and homework assignments for easy reference.